It is the cursive form of Formal Script. 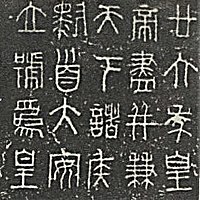 Originated from late Han Dynasty; it is less compact than Formal Script and less cursive than Cursive Hand. It is written according to certain rules. It has concise structures with borrowed components. Although it looks irregular, Cursive Hand has high artistic value beyond its practical worthiness.